This is Anna’s Mother-in-law’s stash… or part of it. 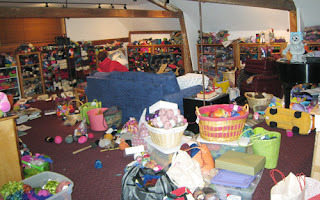 She presents this “Church of Knitters” in her blog “Mochimochi”. My own stash isn’t this big and after seeing this I pray it will never get this big either… though I am inheriting my mother’s stash (from 70’s and on) and as she is of a crafting family, there’s quite a lot of it – but not this much… and I am tossing away some of it. My mother has a taste of novelty yarn, which I personally detest. Right now my stash is all over the living room, buried under paper, dog’s “mess” (sticks and bones), books and clothes… So – no pictures. I have no problems saying that I’m messy, because no-one believes the extend of it anyway – EVERYONE’s a little messy. Even people with “cleaning sickness” believe to be messy.